The Maturity Institute (MI) is a not-for-profit, professional development body established in 2012 to bring whole system thinking to leadership and management for a capitalist system based on maximising societal value. We measure Total Stakeholder Value (TSV), which reconciles market and book values with societal impact. Our methodology and standards are based on existing practice within our exemplar companies. 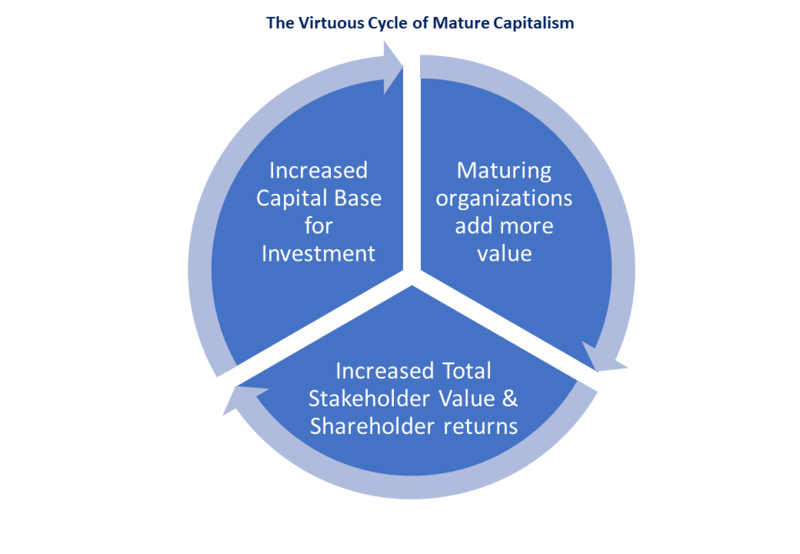 It is simple to implement yet has profound and long-term effects on business performance and market value. Our work has already gained significant traction within corporate, investment, regulatory, and academic environments. MI aims to achieve widespread acceptance, recognition and utilisation of MI’s approach and global standards as critical diagnostics and leading indicators of long term organisational health and societal benefit – with investors, boards, regulators, academics and related stakeholders. MI has a professional membership, all of whom have undertaken formal training, and operate under the quality assurance of MI, agreeing to adhere to, and abide by, our professional standards. It brings together expertise from an array of backgrounds such as accounting, finance, economic, legal, human capital and general management; all working to consistent standards. Organisational maturity is now taught as part of MBA programmes with much deeper insight into the nature of an organisation; going beyond the constraints and limitations of conventional financial and economic theory. MI operates a community interest, operating company. Our strategy, operations and funding is managed by our CIC under the governance of the MI Council. MI’s forthcoming book, The Mature Corporation, will become our standard text on whole system, mature, management practice and should spur other disciplines and professions to adapt their own thinking and methods. It will be published in early 2019 (Cambridge Scholars Publishing). MI uses a unique question set focusing on all of the crucial factors that, together, produce a picture of overall maturity. Our ‘OM30’ high level, questionnaire is the primary diagnostic instrument to provide comparative assessments of organisational health, encapsulating important insights into governance, corporate culture and the management of human capital systems. Each OM30 question is designed to show causal links to improvement in TSV. OM30 is future focused and brings a predictive perspective to the probability of organizational behaviours being repeated or changed for the better. Maturity analysis, assessments and ratings use external, publicly available information although it is also utilised by corporations to measure their own baseline and monitor progress in mature, organizational development. The OM30 scores produce the ratings which are captured on OMINDEX. This is a new corporate index, developed in collaboration with an S&P agency and mirrors the conventional rating scale (D to AAA). Since 2015 it has been increasingly used by the investment community and regulatory bodies for investment, board level engagement and risk analysis. OM30 is also used as a strategic route map by corporations to achieve material value improvement and develop better risk management.